Finally, after months of winter hibernation (or so it seems) the grocery stores are selling spring veggies and fruit, and I start counting down the days till all the farmer’s markets open! Spring has arrived in Oregon when it starts to get warmer, the days get longer, spring bulbs start to emerge from the ground, and the birds start chirping in the morning. Bright green asparagus is always a sign of spring! There are many many ways to serve asparagus, my favorite is in quiche…..until I made this simple yummy salad! Salads can be more than green leafy veggies. 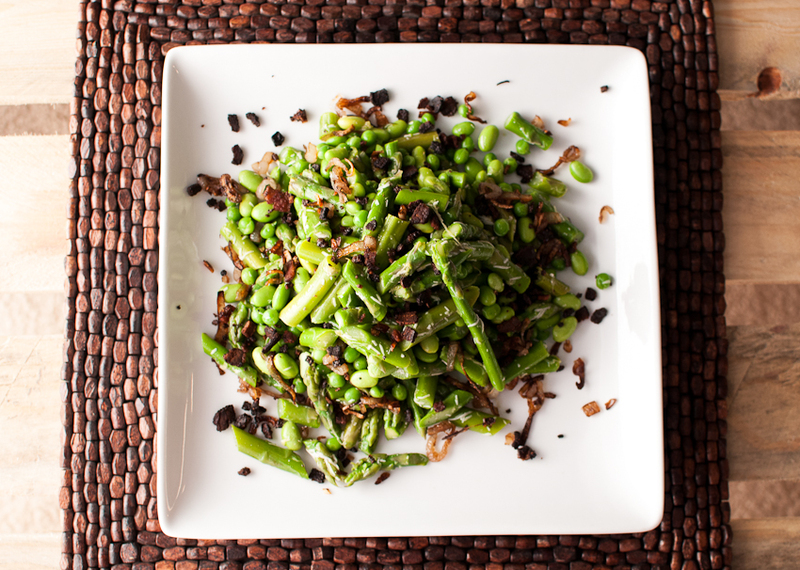 This one consists of asparagus, peas, and soy beans tossed with some bacon and shallots. The crunch of the salad and the saltiness of the bacon makes this spring salad super tasty, and the best part, is it’s quick and served cold. Perfect for a potluck, first spring bbq, or along side a roasted chicken for dinner. This salad also keeps great in the fridge for 3-4 days. What is your favorite Spring salad? Bring water to boil in a large pot, add asparagus and cook until tender, about 4-5 minutes. Place asparagus in a bowl of ice water. Combine veg oil and shallot in a pan over medium heat and sautee shallot until medium brown and crisp. About 10 minutes. In a large bowl toss all vegetables with dressing, top with shallots and bacon when serving. 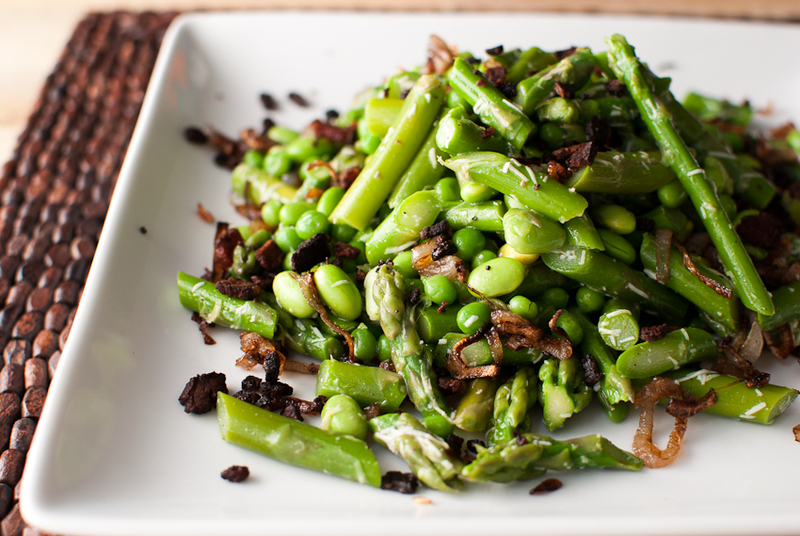 Note- if using fresh fava beans or peas, make sure to cook in some boiling water like the asparagus.